What I wondered at the time I wrote the piece, and still wonder today, is whether these stories were influenced by Captain Marvel. 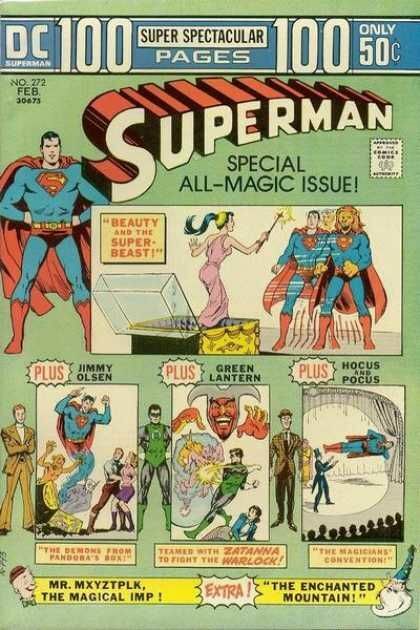 That character debuted a few years before Hocus & Pocus, and his more whimsical stories seemed to prove more popular than Superman's. Plus the two characters shared a number of writers, and there seemed to be a sense of cross-pollination between the two. The Hocus & Pocus stories seem more suited to Captain Marvel than Superman, so I'm left wondering if the original was a rejected Captain Marvel script in which Superman was simply substituted in place. The last of Hocus & Pocus' appearances was in 1947, and while National had started their infamous lawsuit against Fawcett in 1941, the trial did not begin until early 1948. It's only after that that Hocus & Pocus' roughly yearly appearances dropped down to nil. It's circumstantial at best, but I can't help but think that the lawsuit helped kill the two magicians.